One in eight women will be diagnosed with breast cancer in her lifetime. You probably know someone affected by the disease. Are you ready to stand up and kick complacency to the curb? The average cost for a mammogram and clinical breast exam in the Greater New York City area is $425. Join Club 425 through a one-time gift of $425, or a monthly contribution of $35.41 for one year. Your donation ensures a New Yorker will have access to the mammogram and clinical breast exam she needs. Your donation may even save a life. Save a life, like Alantheia's. Her life is complete with her grandchildren — grandchildren she thought she would never got a chance to see grow up. That was her biggest fear when she first heard the words, "You have breast cancer." 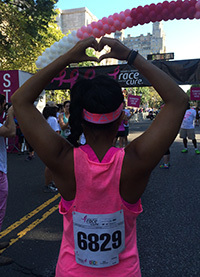 Alantheia is forever grateful to Komen Greater NYC supporters. If it wasn't for you and all of our special donors, Alantheia would not have received the screening and treatments that saved her life. Thank you for joining Komen Greater NYC's monthly giving program, and giving women like Alantheia the chance to meet their grandbabies.